A literature review is made up of several different parts. Depending on the purpose of the review and what it will be used for, some parts of the lit review may not always need to be included. Introduction – The introduction will include a topic or thesis of the paper stated in very clear terms. It should also include an explanation of why the topic is important and your thesis statement. Body – The body will contain your summary and analysis/evaluation of the reviewed literature. You should also identify any unanswered questions any controversies in the literature field. Conclusion – Summarize your major points and show the significance of your analysis. Summarize key questions and controversies that remain unanswered and indicate the need for further research. Reference page – The reference page will include every source that you have cited in your paper. These sections make up the parts of a lit review that should always be included. Moreover, it’s worth visiting our site where you may get additional information about literature review topics. 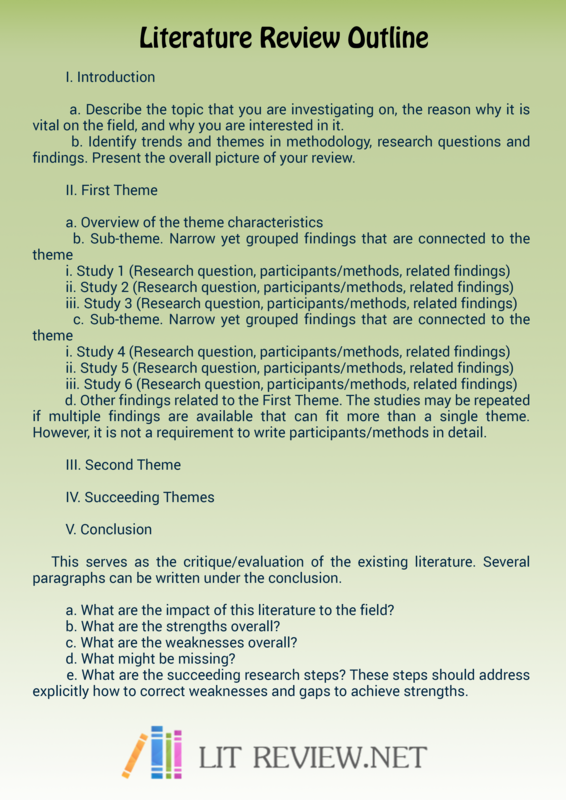 Title page – When submitting a literature review written in APA style it will be necessary to include a title page. The title page will include the title of the paper, the author’s name, and the institutional affiliation. Abstract – On occasion it will be necessary to include a literature review abstract. The abstract is a concise summary of the literature review written and organized in the same way as the literature review. It is important that whichever components of a lit survey you include, that you follow the guidelines set by where the paper will be submitted. If you are unsure what parts of the literature review should or shouldn’t be omitted, or you are having difficulty with any other aspect of your lit review, our service can help. Writing a literature review isn’t always easy. Whether you’re unfamiliar with literature analysis, or you just don’t have the time, our literature review writing service is here to help. The professional writers we use are experts in the literature analysis process. They have the skills, knowledge, and experience to provide literature reviews that will meet the highest standards. Every literature review we provide is completely original and plagiarism free. When you need literature review contact us and take advantage of our professional writer’s literature review expertise!